First, let’s take a look at what osteoarthritis actually is. Osteoarthritis is a chronic disorder that affects movable joints, compromising the articular cartilage, underlying subchondral bone, and surrounding soft tissues (Palmieri-Smith et al., 2017). It mostly affects the hands, spine and joints such as hips, knees and ankles. It is the predominant condition leading to knee and hip replacement surgery in Australia (Australian Institute of Health and Welfare, 2018). Although osteoarthritis can get worse over time, it is not an inevitable part of ageing and isn’t always progressive (Australian Commission on Safety and Quality in Health Care, 2017). You can manage your symptoms and improve your physical activity by revising risk factors such as excessive weight. Being overweight increases risk of osteoarthritis by two times, being obese increases the risk by four times (Australian Commission on Safety and Quality in Health Care, 2017). Osteoarthritis isn’t necessarily degenerative, and it doesn’t always get worse over time despite common belief. Osteoarthritis can be made worse by avoiding movement and exercise. For a long time, the recommendation has been to “rest, avoid pain” however the associated muscle wastage and decrease in strength and mobility of the affected joint is what makes osteoarthritis appear to be degenerative. For all the visual learners, the video below gives an explanation on how a physiotherapist can help your osteoarthritis. Conservative management* (including exercise, weight loss, and education) are recommended at ALL stages of the disease- this is important to remember (Australian Commission on Safety and Quality in Health Care, 2017). Whatever stage your osteoarthritis is in, exercise, weight loss and education can be a benefit to you. Surgery isn’t your only option, and certainly shouldn’t be your first option. The Australian Commission on Safety and Quality in Health Care found that fewer than 10% of those on waiting lists for joint replacements, incorporated weight loss into their management plan for their osteoarthritis. Even when patients ultimately require surgery, weight loss and exercise is still recommended as the best practice to improve the functional outcomes before and after surgery. Exercise can delay and even prevent the need for surgery. There are a lot of misconceptions when it comes to health- and osteoarthritis is no exception. If you want to understand more about the condition, and how manage your symptoms, we’re here for you! If you’re wanting to seek help from a physiotherapist but you’re unsure of the process, we’re giving you an insight into how we assess a client with knee osteoarthritis. We’re hoping this transparency shows you that it’s nothing too intimidating and shouldn’t be something that you put off. Atypical findings suggestive of another cause for the presenting complaints that warrants further investigations. Assess the client’s function, including movement during daily tasks, take observations of bony shape, skin integrity and posture, assess the joint range of motion, muscle tone and strength, balance and flexibility. Prescribe an appropriate exercise program for the client and monitor this program for 6-12 weeks to ensure the level of exercise is gradually progressed. Exercises may include: lower body and core strengthening, balance, stretches, and/ or water-based therapy. Determine whether the client is interested in group exercise classes and support their engagement and participation in appropriate classes. Make necessary referrals and advocate for the client depending on their needs, and level of function. (Caitlin Daley, Physiotherapist at Transcend Health) and (Australian Commission on Safety and Quality in Health Care, 2017). At Transcend Health, we are about inspiring and helping you to move your body, and experience life unrestrained by pain, injury, disease and illness. Whatever your favourite way to move is (physical activity, exercise, sport, active play, etc) we will help you to keep moving and doing the things you love longer. We are a team, combining physiotherapy and exercise physiology with a whole lot of passion for all forms of movement. We can’t wait to share our philosophy and help you move beyond mediocrity. Give us a call on 02 4961 3399 to see how we can help your osteoarthritis. 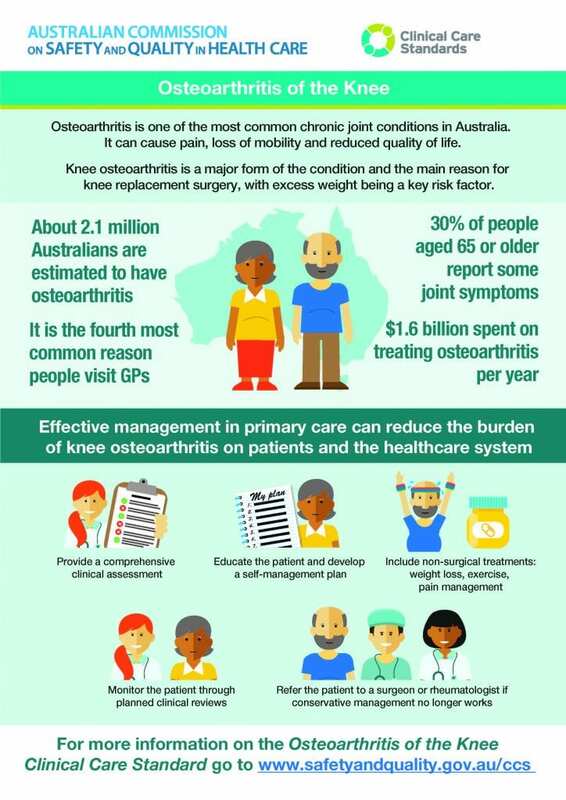 *Conservative management: Non-surgical management of a condition; for knee osteoarthritis this includes activities such as patient education and self-management, weight loss and exercise (non-pharmacological interventions), and use of medicines such as analgesics and non-steroidal anti-inflammatory drugs (pharmacological interventions) (Arthritis Australia, 2014). Arthritis Australia. Time to move: osteoarthritis – a national strategy to reduce a costly burden. Sydney: Arthritis Australia, 2014. Australian Institute of Health and Welfare. (2018). 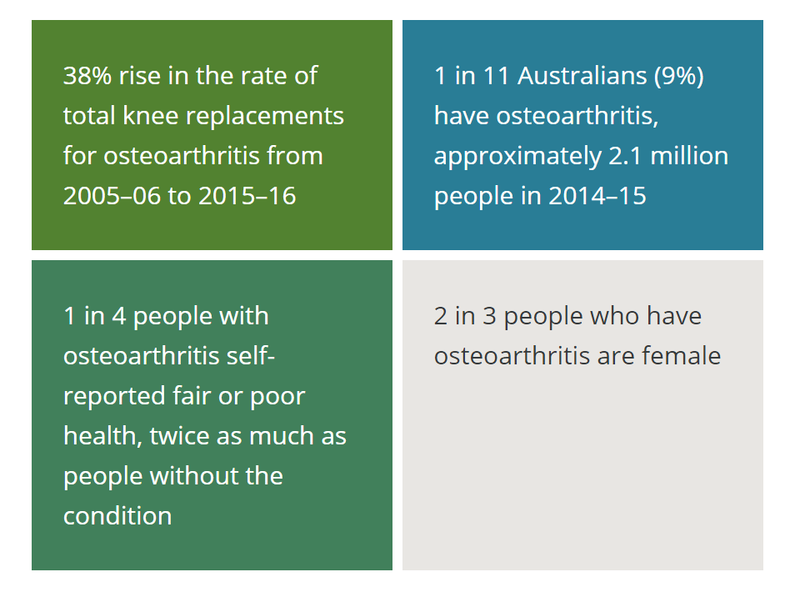 Osteoarthritis, Data – Australian Institute of Health and Welfare. [online] Available at: https://www.aihw.gov.au/reports/arthritis-other-musculoskeletal-conditions/osteoarthritis/data [Accessed 13 Jul. 2018]. Palmieri-Smith, R., Cameron, K., DiStefano, L., Driban, J., Pietrosimone, B., Thomas, A., Tourville, T. and Consortium, A. (2017). The Role of Athletic Trainers in Preventing and Managing Posttraumatic Osteoarthritis in Physically Active Populations: a Consensus Statement of the Athletic Trainers’ Osteoarthritis Consortium. Journal of Athletic Training, 52(6), pp.610-623.